I sparred with a guy tonight who has been fencing for five years... but was using his right hand due to an injury ("Why are you smiling?" "Because I know something you don't know..."). He went pretty easy on me, but I still got in three good points. It's a small world- turns out he was an old work buddy of the founder of GameTap! 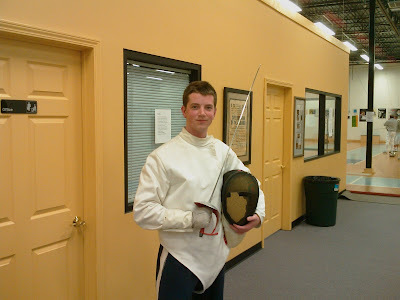 I'm still digging the fencing lessons immensely. I'll have to evaluate how to continue training when my month of lessons is up. what a great picture. i love a happy ryan :) your family totally wins the thoughtful gift award for the 2007 christmas season. You look way cool (I was going to say "hot" but that would be weird, coming from your mother!)! Now how long do you think Kyle will wait for us to start our lessons?? BTW, I'm still waiting for you to deliver Colin Firth.